As the credit crunch bites there is no denying that times are tough and if predictions are to be believed they will only get tough. Consumers are facing not only money problems but also a crisis in confidence in the economy. Consumers don't know where to turn or what to do next. One option of of course is an Individual Voluntary Arrangement or an IVA for short. IVAs are a less severe option to debt than bankruptcy. The creditors i.e. the lenders who the consumer owes money to agree to write off a proportion of the debt and the consumer then pays the remaining balance through a detailed payment plan. The IVA means the consumer does not have to pay the whole amount they owe which is obviously hugely beneficial to them. However that is not to say there are not consequences to entering into an IVA. Consumers who enter into an IVA seriously affect their credit profile for many years to come. The IVA is registered on the credit profile so any time the consumer attempts to get credit in future they will find it difficult. The lender will be aware that the consumer has had serious financial trouble in the past and therefore will be reluctant to lend to that consumer. The lender must protect itself and does not want to lend to someone who is going to be unable to make the necessary repayments.This means the consumer will struggle to get a mortgage, credit card or any other form of credit. Will More People Get an IVA Due to the Credit Crunch? Never the less, despite the downsides of IVAs it is expected that more and more people will opt for them now the credit crunch has hit. 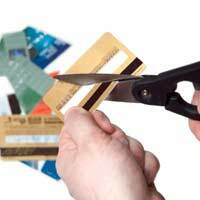 Consumers should not underestimate the effects of the credit crunch - debt is going to rise. The credit crunch began in America. Many lenders gave mortgages to people who had no way of repaying them. They therefore defaulted on their payments and in many cases had their homes repossessed. When lenders give mortgages they sell these 'bundles' of debt on to other lenders and these bundles often include other forms of debt such as credit cards and loans. When borrowers default on these payments the bundles lose their worth leaving many lenders with useless bundles of debt that that they cannot sell on - and other lenders are reluctant to buy bundles in case they include the defaulted mortgages. This means lenders do not have the money they would have had from selling the bundles and therefore they don't have the money to lend to new customers. IVAs will become more popular as the credit crunch continues to takes hold and consumers look for a way out of their spiralling debt. However they should not ignore the consequences of entering into such an agreement and they should only even enter into an IVA as a last resort when all other options have been explored and there is no other solution.